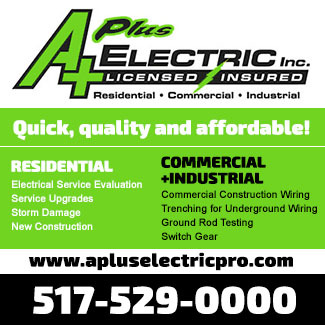 Click here to download a .pdf copy of this map. Ted Ligibel, who wrote the history of Clark Lake adds a virtual artifact to this website. “It’s one of the earliest, if not the first, state government maps of the county”, says Ted. 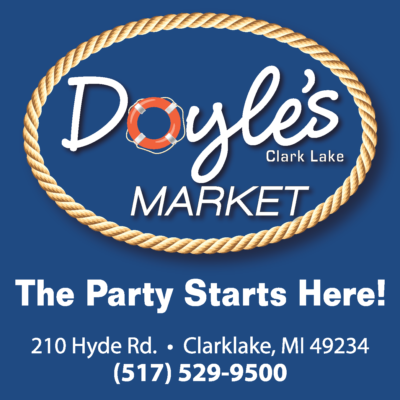 And of course it includes the county’s favorite lake– Clark Lake. 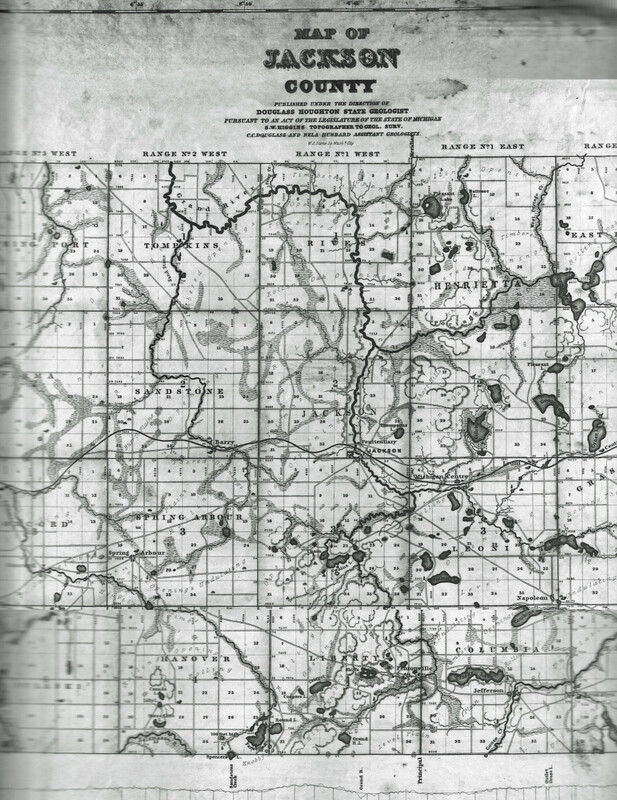 According to a 2013 Cit Pat article (posted on MLive), the map was created in 1844 and “though there were previous surveyor maps, this is the first detailed map that indicates some of the geological and other highlights of the county a little more than a decade after its settlement.” Ted indicates that the map was created by Douglass Houghton, while he was state geologist. Consider what early map making must have required. The Cit Pat article quotes Houghton’s description of the challenges: “Wading the streams by day, tortured by swarms of mosquitoes at night – often short of provisions, and often drenched by rain – were it not that courage is uplifted by the love of science, both for its own sake and the good it is to accomplish, the task of the pioneer explorer would be hard indeed.” Houghton perished in Lake Superior on a survey mission. 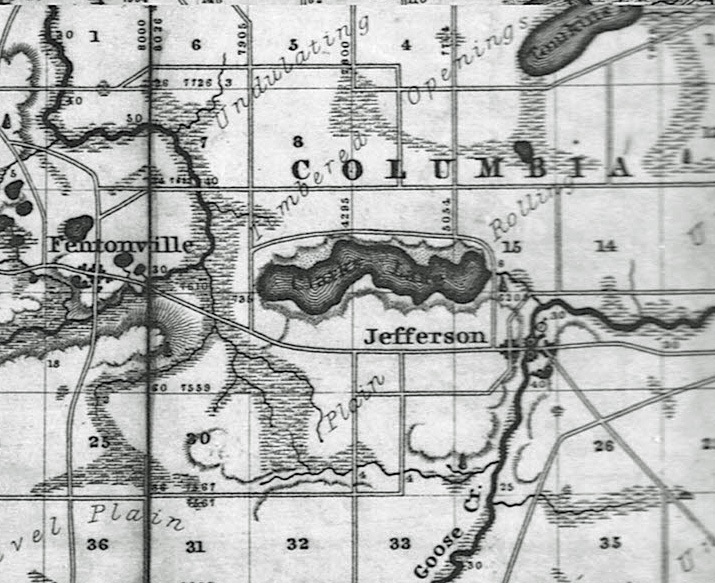 As you look over the Clark Lake inset, you’ll notice a settlement to the west called “Fentonville.” Anyone heard of it? That perhaps deserves a bit more research. Ted explains that the late Joe Collins gave him the map as the Clark Lake book was being written. Joe Collins had purchased it from the Michigan Historical Collections of the Bentley Historical Library at the University of Michigan. The view below includes more of Jackson County. 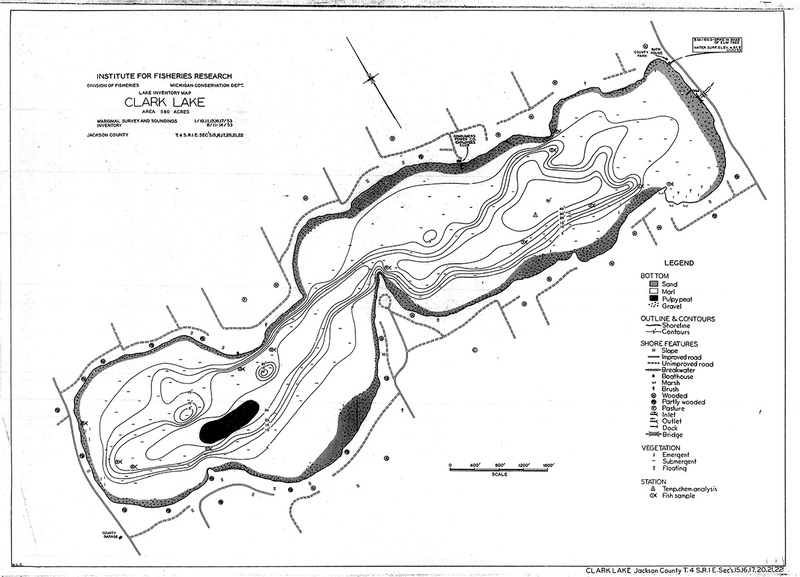 Below is a Clark Lake map from the 1960s. A few copies still exist, and you can see this one on the wall at Doyles Market. 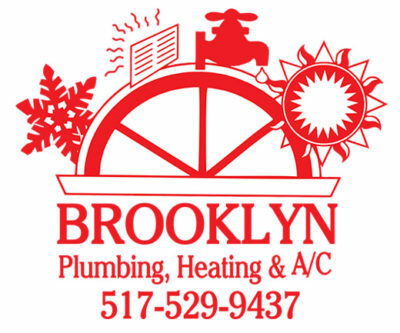 The map includes ads from area businesses. There’s an adage that goes something like this: when going somewhere it helps to know where you have been. Many at Clark Lake have a love for its lore, particularly those who have generational attachments to the lake. 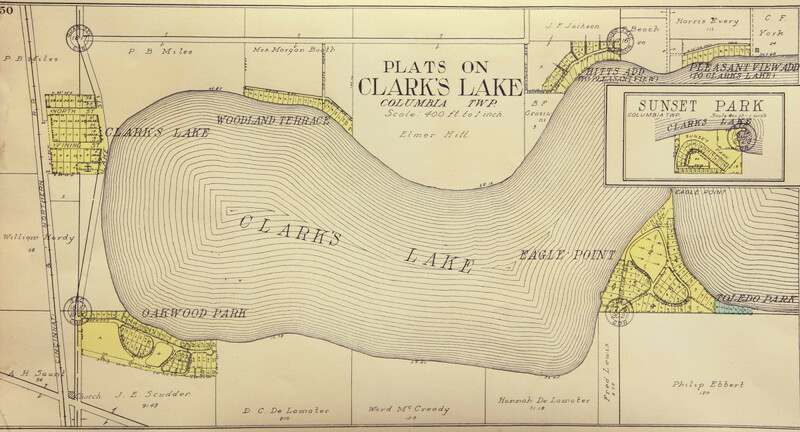 So with that, here’s part of the story of another historical map that gives context to the days when Clark Lake began to transition from an agricultural outpost to a recreational retreat. 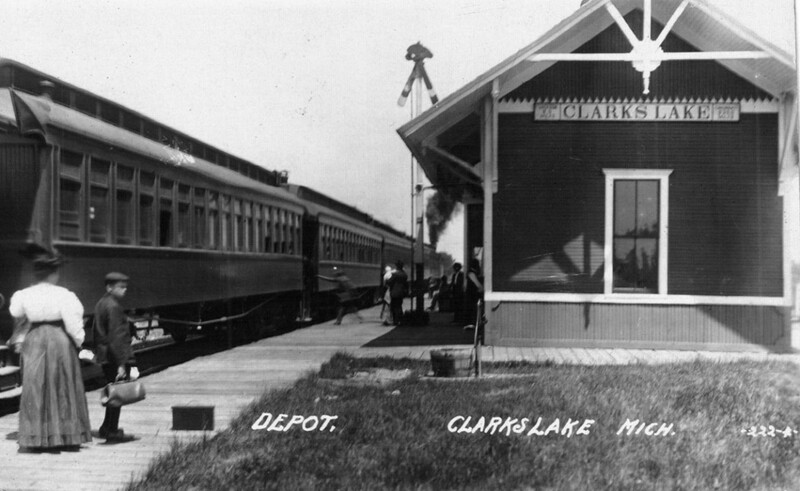 The Cincinnati Northern Railroad promoted the idea that Clark Lake was the perfect place to escape the summer heat in Kentucky and Ohio. No doubt their objective was to increase ridership and they delivered the escapees to Clark Lake at the depot that once stood at the end of Vining Street. 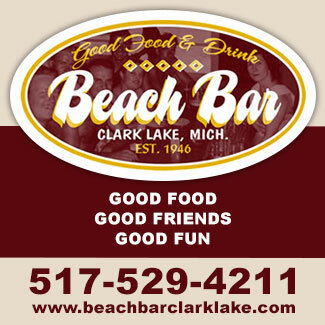 The family had spent summers at Clark Lake previously. Here’s Carlotta’s description of their return to the lake with her, as a baby. “It was only natural that he [her father] would first turn to that point of land that he had fallen in love with, only to find that three small cottages had been built there. After days and days of half-heartedly searching the lake for another acceptable spot, he came to realize that there was no substitute for his first love and that, three cottages or not, the only place for him was that little bit of Eden. There was simply no other. “It was undoubtedly a very happy papa who succeeded in negotiating an agreement to buy that little bit of land that was to mean so much to him and his family and play such an important role in their live lives in the future. 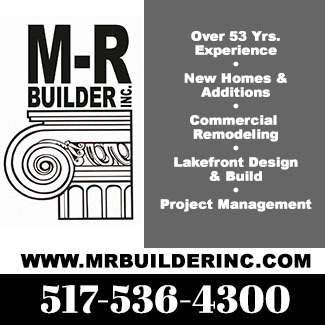 Not only did he buy the land with the three cottages, but Mr. Hitt agreed to sell him three additional acres of lake front property. Three acres of lakefront property on Clark Lake? Things have changed! Perhaps some of our residents who are interested in history will take a look at this map and write about the rest of the story. The original is hanging in the Columbia Township offices on Jefferson Road. You can find it on the south wall in the auditorium where the Township trustees have their formal meetings. Many thanks to Sue German for making a copy of this map so that it could be displayed on this website. Last week I had the good fortune to be included in a small group, including Ann Swain and Dean & Betsy Frazen, who were invited to spend some time in the home of friends on Beaver Island, in northern Lake Michigan. While there I had the opportunity to observe the oldest map of Michigan I have yet found. 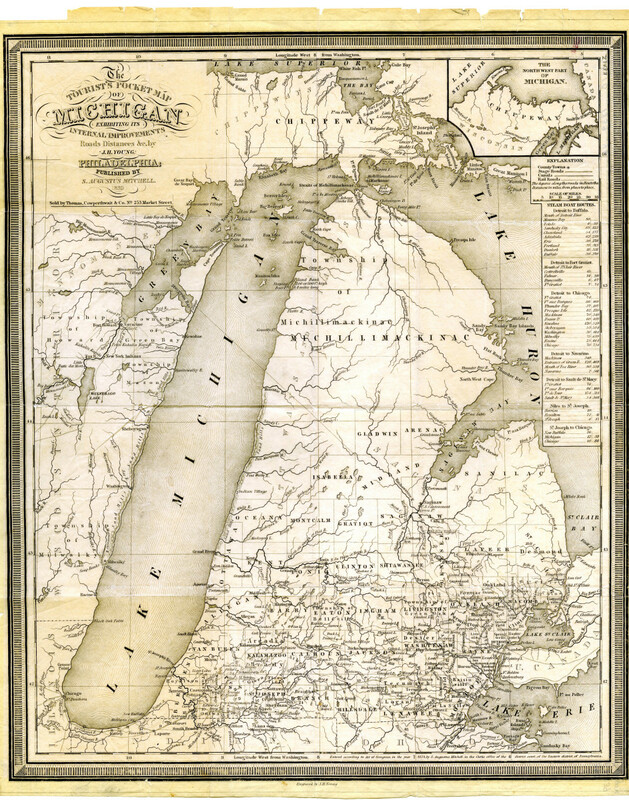 In 1839, S. Augustus Mitchell of Philadelphia published this “Tourist’s Pocket Map of Michigan.” This was only two years after Michigan achieved statehood, and much of the northern portions of the state were still relatively unknown. 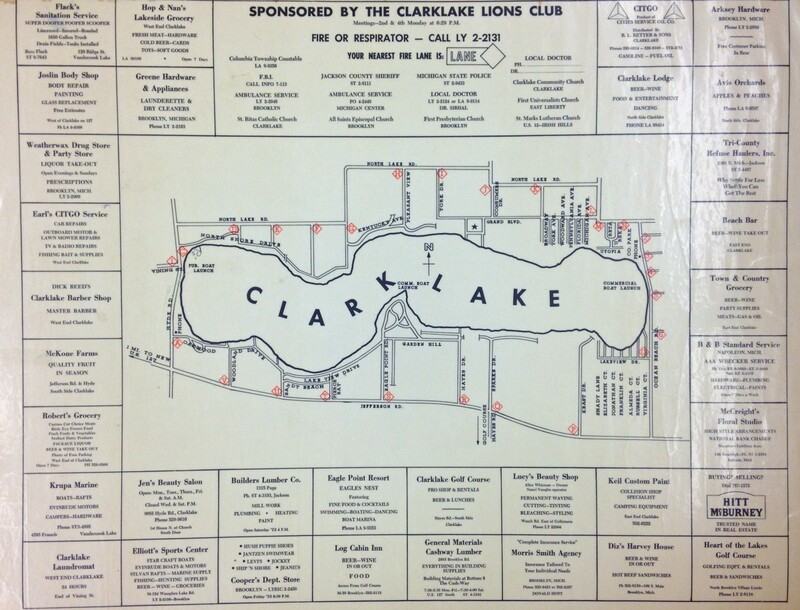 This map is very similar to the 1830 map found on page 18 of Ted Ligibel’s book, Clark Lake: Images of a Michigan Tradition ( Clark Lake Historical Preservation Committee, 1991). A Google search of the Internet found additional information on this matter. Much of the detail of this 1839 map was drawn from an earlier, 1831 map, by John Farmer, which was published in NYC by J.H. Colton & Co. At that time, only the southern half of the state had been broken up into counties. Nearly everything north of Mt. Pleasant was still in Indian hands and was included in one massive township called Michillimacinac. Little was known of the Upper Peninsula beyond St. Ignace. Due to the age of the map, I would conclude that most of the local information was based on Robert Clark, Jr.’s original 1824 survey. Looking closely at the map, I found some historic points that I thought might be of interest to my Clark Lake neighbors. 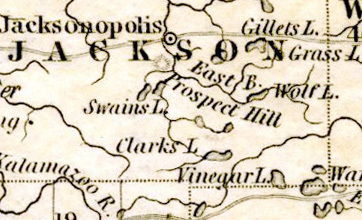 Specific points of interest in regard to Jackson County include the fact that the city of Jackson was then known as Jacksonopolis. There is also an indication of an Indian Village shown on Rice Creek (Kalamazoo River tributary) north of present day Albion. Although without a name, this village was also shown in W. B. Hinsdale’s Archeological History of Michigan (University of Michigan Press, 1931, Ann Arbor). A few of the well-known area lakes were also included in this map, some with different names or locations. Clarks Lake, Wamplers Lake and Gillets Lake are named and shown fairly correctly. 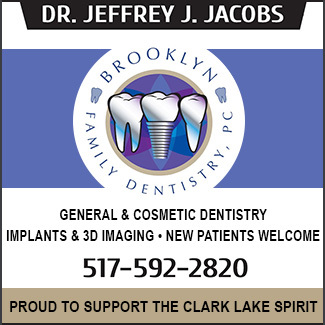 However, Clarks Lake and Swains Lake are shown as draining into the Grand River. Swains Lake, actually near Concord, is shown directly north of Clarks Lake. Actually, Clarks Lake drains into the Raisin, and Swains Lake drains into the Kalamazoo. Vinyard Lake was shown as Vinegar Lake, and Devils Lake is shown with the alternate Indian name of Michemanetue. 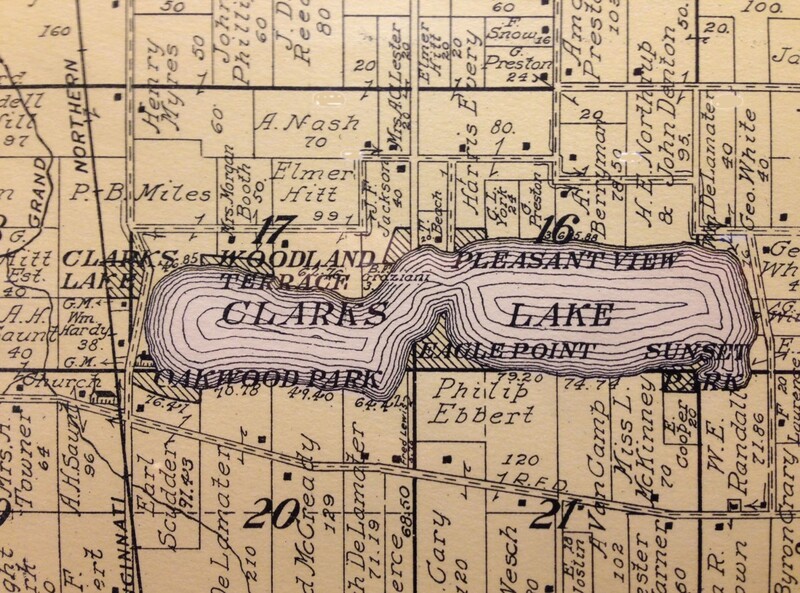 All of this shows how uncertain the topographic details were to those earliest settlers of the lake in 1834 and 1835. Even the question of the drainage divide between Lake Erie and Lake Michigan was apparently still uncertain.